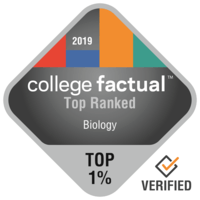 2019 Best General Biology Colleges in the U.S.
Around 81,522 students graduate with a major in General Biology per year. This means it is a reasonably popular choice for students, earning it a ranking of 5th most popular out of all 384 college majors evaluated. After reviewing 121 majors in our database, General Biology is ranked 67 for the early career income of graduates. Find out which school is best for you, as some deliver better outcomes than others. Below you'll see a list of the best colleges and universities to study General Biology. Our ranking methodology takes into account education quality, average earnings of graduates, accreditation, and several other relevant factors. Massachusetts Institute of Technology is the best option for students thinking about a General Biology degree. In addition to its bachelor's programs, Massachusetts Institute of Technology offers graduate degrees in Biology. Cambridge, Massachusetts is an ideal area for learners who enjoy the fast-paced city life. Stanford University is among your best bets if you're planning on studying General Biology. Stanford University offers graduate degrees in biology for those interested in an advanced degree. Based in Stanford, California, Stanford offers a dependable, suburban atmosphere for young people. It is hard to beat Tufts University if you want to study General Biology. Biology majors from Tufts University earn a boost of approximately 33.7% above the average earnings of general biology graduates. Based in Medford, Massachusetts, Tufts delivers a secure, suburban environment for college students. For graduates who wish to carry on after earning a bachelor's degree, Tufts University has graduate programs available. Tufts has an impressive student-to-faculty ratio of 8:1, so learners have lots of chances to interact with their professors. Get a better idea of what student life at Tufts is like by viewing some campus videos. University of California - San Diego is among your top options if you want to study General Biology. Students who graduate from the biology program make about $42,764 in their early career salary and $87,117 in their mid-career salary. University of California - San Diego is among the largest schools in California. High quality education for student veterans has earned University of California - San Diego a high rating. For students who would like to carry on following their bachelor's degree, University of California - San Diego has graduate programs available. In what areas is UCSD doing the best? Check out all the college rankings. Wake Forest University is a great option for students pursuing a General Biology degree. In addition to its bachelor's programs, Wake Forest University offers graduate degrees in Biology. Positioned in Winston-Salem, North Carolina, this college is a good final choice for students who enjoy the exhilaration of a popular city. This school's student loan default rate of 1.6% is far below the U.S. average of 7.0%. First-year students are not required to live on-campus at Wake Forest University. If you are interested in knowing more, you can see all of Wake Forest University's rankings here. Rutgers University - New Brunswick is among your best bets if you want to study General Biology. Grads of the biology program state that they receive average early career wages of $44,395 and mid-career wages of $92,176. The setting in a big city is tremendous for scholars trying to find adequate chances for social networking, experience, and life. You shouldn't be concerned about affording Rutgers University - New Brunswick; 52.0% of their undergraduates obtain financial assistance. Graded #1 in New Jersey for overall value, we would have predicted this university's superb educational programs to be more expensive. Find out about what campus life at Rutgers New Brunswick is like by enjoying some campus videos. It's hard to find a better school than Duke University if you wish to study General Biology. In addition to its bachelor's programs, Duke University offers graduate degrees in Biology. The setting in a big urban center is wonderful for students seeking ample chances for networking, experience, and discovery. It's difficult to beat Texas A&M University - College Station if you wish to study General Biology. In addition to its bachelor's programs, Texas A&M University - College Station offers graduate degrees in Biology. Situated in College Station, Texas, this college is ideal for students who prosper in a city atmosphere. Any student who is interested in General Biology needs to look into Emory University. Soon after getting their bachelor's degree, biology students generally make an average of $40,329 in the first five years of their career. Situated in Atlanta, Georgia, Emory supplies a dependable, suburban environment for college students. You'll get to meet others from numerous ethnicities thanks to Emory's diverse population. Emory University requires freshman students to live on-campus. Ever wish schools were graded with a report card? Now they are. Check out Emory University's scorecard. University of Notre Dame is among your top options if you're planning on studying General Biology. University of Notre Dame offers graduate degrees in biology for those interested in an advanced degree. Positioned in Notre Dame, Indiana, Notre Dame supplies a comfortable, suburban environment for young people. Notre Dame has a notable student-to-faculty ratio of 10:1, so learners have lots of chances to network with their professors. About 98.0% of first-year students return to University of Notre Dame for their sophomore year. Look at a few school videos for more information on what is happening on campus.